Full Tilt Poker opened in 2004. In 2012, it was purchased by former rival PokerStars. Today, both companies are owned by Canadian gambling giant Amaya Inc.
Full Tilt Poker has its own proprietary software. A downloadable poker client is available for Windows and Mac OS. Examples of poker variants available at Full Tilt Poker are Texas Hold’em, Omaha Hi, Omaha HiLo, Razz, Stud Hi, Stud HiLo, and Draw Poker. Interested in mixed-game? 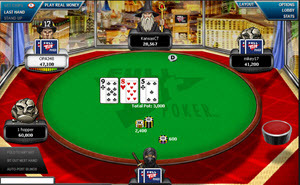 Full Tilt Poker offers both 10-Game, HA and H.O.R.S.E. At the time of writing, Full Tilt Poker is among the top-10 on PokerScout’s lists over poker rooms and poker networks with the most traffic to their cash tables. In addition to the many cash game tables, Full Tilt Poker has a very nice tournament selection for both scheduled tournaments and sit ‘n go tournaments. You can for instance find S & G Steps and S & G Matrix here, ranging from free rolls to high stakes. Examples of tournament formats available for scheduled tournaments are add-on, rebuy, multi entry, shootout, knockout bounty, double chance, triple chance, double stack, super stack, turbo, super turbo and cashout. Many tournaments will allow you to enter even after the start of the tournament. The hight of the Full Tilt Poker tournament schedule is Full Tilt Online Poker Series (FTOPS) and MiniFTOPS. As soon as you complete the sign-up process, you get a free no deposit bonus worth $10. It consists of two Rush Poker tickets worth $2 each + six Jackpot Sit & Go tickets worth $1 each. Full Tilt Poker will give you a 100% match bonus on your first deposit, up to a maximum of $600. The recruitment bonus is $155. There is a loyalty program where you can collect loyalty points. Use the points to buy into tournaments. Full Tilt Poker has an online casino where most of the games comes from NextGen. Mobile apps are available for both iOS and Android, so you can enjoy casino games on your smartphone or table. The selection of games that you find in the Full tilt casino is small compared to that you can find in many other casinos. I recommend that you click here if you want to find a casino with a larger selection of games. Regrettably, there is no phone support or live chat support. The Full Tilt Poker customer support can only be reached by email. The address is support@fulltiltpoker.com. Examples of transaction methods accepted by Full Tilt Poker are VISA, MasterCard, Neteller, Skrill, and Entropay. Since PokerStars and Full Tilt Poker have the same owner, it is easy to move funds between a PokerStars account and a Full Tilt Poker account and vice versa.